The pathogen is becoming more prevalent and beginning to infect bur oak trees here central Illinois, either due to pathogen movement or due to changing environmental conditions resulting in more favorable conditions for infection in the center of the state. 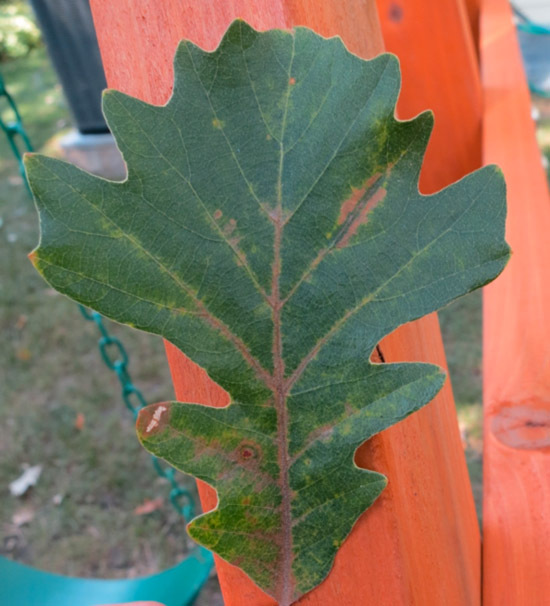 The public is more aware of what symptoms to look for when scouting bur oak trees, resulting in greater numbers of samples and confirmations at the Plant Clinic. Some work has suggested that the variety oliviformis is more susceptible to this disease and it's possible that the pathogen will move within this variety's geographic range. Because identifying varieties can be difficult, the exact range of this variety is not known though it appears to be more common in northern Illinois. 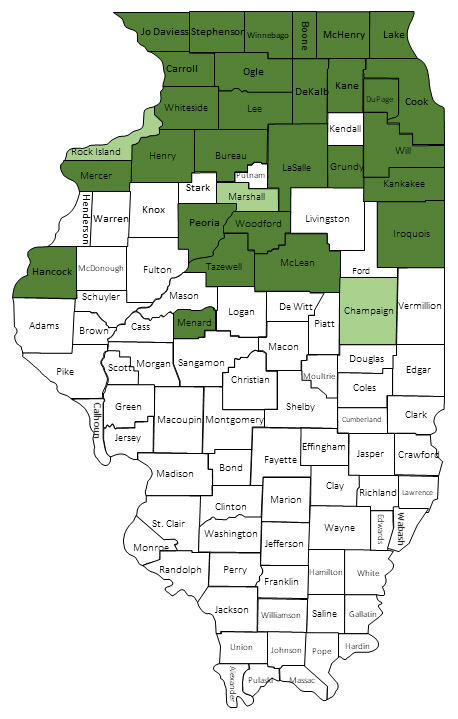 This map indicates the counties in Illinois where bur oak blight has been identified. Dark green counties are where the disease has been confirmed, either by Dr. Harrington's lab or by the Plant Clinic; the light green counties are ones where the Plant Clinic has received samples or pictures that are highly symptomatic of BOB but the Plant Clinic was able to confirm the diagnosis. Bur Oak Blight is a late season fungal leaf blight disease caused by the pathogen Tubakia iownesis. This is a relatively new disease, identified by Dr. Tom Harrington of Iowa State University. Several species of Tubakia are known to infect oak trees and cause minor leaf spots. Tubakia iowensis is the only species known to attack leaf petioles. Additionally, the pathogen will only infect bur oak, particularly Quercus macrocarpa var. oliviformis. Results from his research suggest that the pathogen is native to the region and has only recently become problematic due to a significant environmental change. Moist springs, with significantly more precipitation, have likely created an environment favorable for disease development. Bur oak blight has both spring and summer infection cycles. The spring infection cycle is the most important in terms of disease spread. The pathogen over-winters as pustules on diseased leaf petioles that remain attached to the tree from the previous season (Image 1). During moist, spring weather, fungal spores release from the pustules and splash to newly expanding leaves. Infection occurs before the leaves are fully developed. However, there is a 1-2 month latent period between the initial infection and when the petioles develop symptoms of necrosis. Petiole necrosis eventually kills the leaves, but more importantly, it prevents diseased leaves forming an abscission layer. As a result, the diseased leaves remain attached to the tree into the winter, well after healthy bur oaks have dropped their leaves. The following spring, newly formed pustules on diseased leaf petioles are perfectly positioned to spread fungal spores to newly expanding leaves. Summer infection cycles result in repeated infections to mature leaves. Summer infection symptoms first appear in June as purple-brown spots on the underside leaf veins. In July, the spots expand, and purplish necrotic veins become noticeable on the upper leaf surface (Image 2). The most notable symptoms appear in August and September as leaf veins are killed as the infection progresses and a characteristic wedge shaped necrotic area develops on the leaf blade (Image 3). Coalescing lesions and expanding vein necrosis may cause the leaf to die. Severely affected trees typically have significant leaf mortality and extensive defoliation (Image 4). While alarming and unsightly, the summer infection cycles do not appear to play a significant role in year to year infections. Image 1. 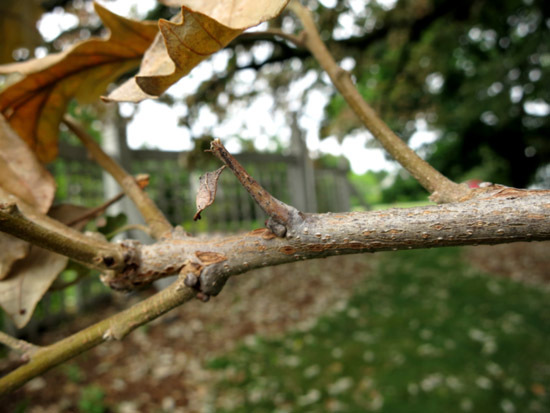 Branch with diseased petiole still attached from previous growing season. Note the small black pustules. Diseased leaf retention is currently one of the best ways to identify this disease in the field. During winter months, scout bur oak trees for leaves and petioles attached from the previous growing season. Infected petioles will have black pustules or scars from previously attached pustules (Image 1). The other species of Tubakia that infect bur oak are not known to produce these overwintering pustules. 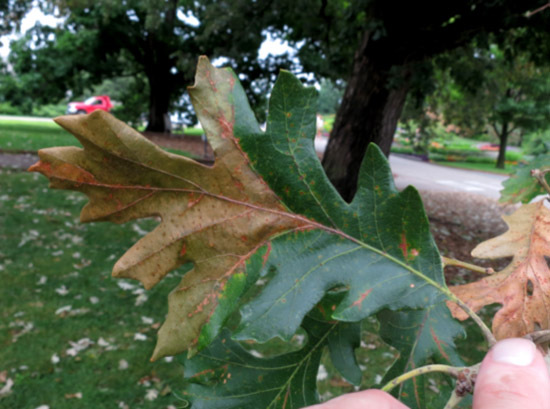 Initially, bur oak blight infections may be limited to the lower braches. Symptoms intensify from year to year and progress from the lower branches to the entire crown. Several successive years of severe infection and defoliation have been reported to kill trees. Death has also been attributed to secondary invaders such as the two-lined chestnut borer. Trees infected with bur oak blight appear to have increased susceptibility to these secondary invaders. Fortunately, this disease will not affect all bur oaks. Many bur oak trees have a resistance to this pathogen. Healthy, unaffected bur oak trees are commonly found growing in close proximity to severely infected trees. Raking diseased leaves will have little effect on controlling the disease. The primary infection occurs from the abundant spores produced from diseased petioles that remain attached to the tree. For high value trees, Iowa State University found trunk injections of propiconazole to be effective at controlling the disease. Applications require specialized equipment and will need to be made by a certified professional. The recommended application rate is 8-10 mls per 1"DBH. Higher applications rates reportedly resulted in phytotoxicity to leaves. The rate will also need to be adjusted if the tree has significant branch dieback in the canopy. One application should last several years. Iowa State currently recommends repeat application only after a severe outbreak re-occurs. 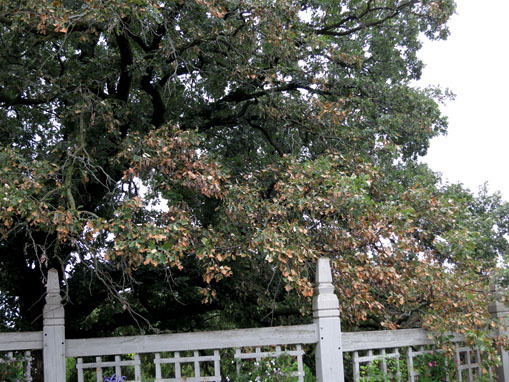 Published Research Article-- Harrington T, McNew D, Hye Young Y. Bur oak blight, a new disease on Quercus macrocarpa caused by Tubakia iowensis sp. nov. Mycologia January 2012;104(1):79-92.